Retailers are continuing to embrace the use of IoT, whether it’s in warehousing and supply chain, or in smart clothing and jewelry, IoT continues to add value to the industry. IoT is a network of connected physical objects that allows devices to communicate, analyze and share data via networks and cloud-based software platforms. xocbox continues to develop this technology and current products include the Xenvision Product Imaging System and the Serial Shipping Container Module. Xenvision, is an integrated camera platform based on open source hardware that works directly with the xocbox product manager applicaton. This provides a complete listing solution for retail store owners, from initial photography right through to the detailed product page in their online store. Photographs can be taken with the xenvision product imaging system. 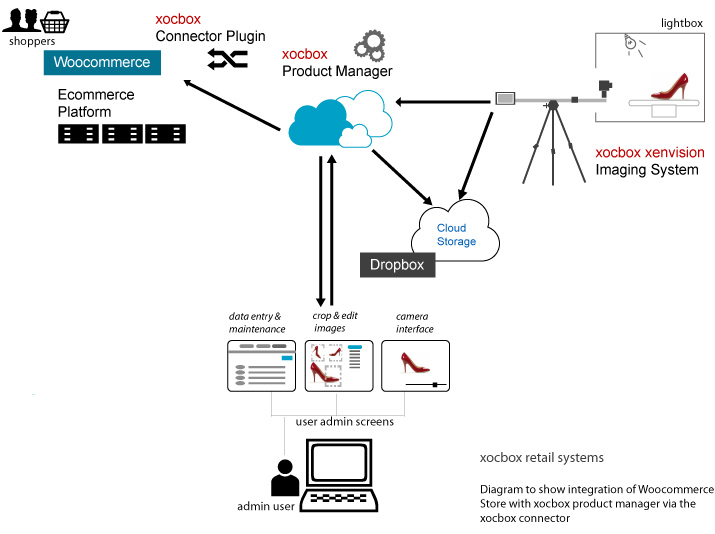 The diagram below shows the xocbox product system architecture with a Woocommerce store. The positioning of the camera and the camera functions (shutter speed, white balance etc) can be controlled directly from within the application screens. The system supports multiple image views including the creation of 360 image sets. Images are then managed through administration screens via the product manager, and stored in Dropbox. Product images are automatically associated with the correct product data. The system generates the image file names according to the correct naming convention, which eliminates errors associated with data entry. Once descriptions, data, and images are in xocbox, products can be pushed to an online store in a single step.